“Canterbury’s past is as rich as it comes” says the latest Lonely Planet guide to Britain. Its world-famous Cathedral was one of medieval Europe’s great places of pilgrimage and learning. And it still has a distinctly cosmopolitan feel. Less than an hour from London, it’s in that corner of England that’s almost touching France. People come here from across the world for world-class heritage, for culture and festivals, to visit and to study, to shop, eat and hang out. The extraordinary Cathedral dominates the medieval streets within the city walls. Among the listed buildings, a boldly modern theatre has been built on the river bank, and an art museum has been restored and doubled in size. To the south is St Martin’s Church, the oldest church in the country, and St Augustine’s Abbey, both part of the Canterbury World Heritage Site. There’s something warm and mellow about this intimate city. Crowds throng around the entrance to the Cathedral and in the busy high street. It’s lively and fun. But it’s also remarkably easy – in a moment – to step off the beaten track into some quiet oasis where you’ll hear nothing but birdsong, and the splash of oars on the narrow, gently flowing River Stour. You may be in a city, but you get a strong sense of being in the Garden of England too. There are riverside gardens and even a cider-making orchard within the city itself. Then there’s all the local produce in cafes, pubs and restaurants: Romney Marsh lamb, Kent cherries, ale from local hops, award-winning fizz from Kentish vineyards. To the north of the city is one of England’s largest ancient woodlands, the Blean. And, less than a 7-mile cycle away at Canterbury’s coast, there’s lovely little Whitstable, for England’s finest oysters. There is so much to explore, that you will needs days to explore it all, so why not stay overnight and enjoy all the Canterbury district has to offer. Below are just some of the things to see and places to stay for a two day stay. You can even stay in the grounds of the Cathedral itself. You may view a short video about Canterbury here. Canterbury Cathedral Lodge is a unique and contemporary hotel, uniquely situated within the private grounds of Canterbury Cathedral. Guests enjoy free entry to the Cathedral throughout their stay, saving £12.00 pp. The luxurious ABode Canterbury is situated in the heart of the city, just a short stroll from the Cathedral. For more suggestions, visit the Visit Canterbury website. From global brands in the High Street and the Whitefriars shopping centre, to independent stores in the history-rich back lanes in the city centre – Canterbury has it all. The Cathedral Quarter, often called the soul of the city as it is clustered around the Cathedral, offers a cornucopia of choice, from the Cathedral shop to fragrances, clothes and shoemakers. Explore the King’s Mile for traditional traders offering jewellery, crafts, gifts, antiques, artwork, clothing and more, along with places to eat and drink. There is nothing more special than something genuinely hand-made and imbued with the maker’s love, creativity and skill. Canterbury has a surprising number of crafts-people doing just that; from chocolate to jewellery and pottery to gin. For an insight into the work of these crafts-people, view a short video ‘Handmade in Canterbury’. Guided tour of Canterbury Cathedral. Marvel at the stained glass windows and visit the place where Thomas Becket was murdered. Canterbury Tales Visitor Attraction. Experience the sights, sounds and smells of a bygone era in this fabulous recreation of medieval life; a unique introduction to Canterbury and its famous literary connection. Lunch: Visit the Goods Shed, a daily farmers’ market with on-site restaurants using the local market produce. Visit the oldest church in the country, St Martin’s Church and St Augustine’s Abbey, which, together with the Cathedral, form the Canterbury World Heritage Site. Forget about the diet for a day and find out what Huffkins and Puffkins are at Tiny Tim’s Tearoom which offers a relaxing and luxurious 1930s atmosphere. 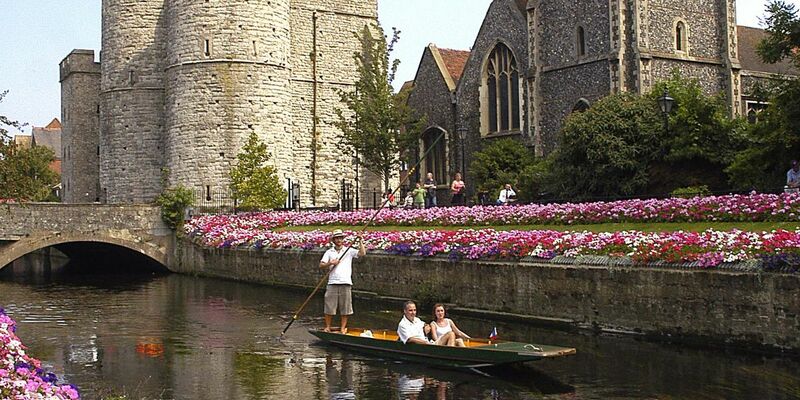 Flowing through the heart of historic Canterbury, the River Stour is the perfect way to escape the hustle and bustle of the city centre, allowing you to discover parts of the city that one can only see through Canterbury Historic River Tours or the Canterbury Punting Company. Alternatively, visit Canterbury’s Beaney House of Art & Knowledge for stunning art exhibitions, Kent’s Museum of Freemasonry or the Westgate Towers, England’s largest surviving medieval tower. Evening: enjoy a show or concert in the Marlowe Theatre or see what’s on at one of the other many venues in Canterbury on the Canterbury Culture website. For a pre- or post-theatre meal try The Corner House (home made, local produce), Pork & Co (free range pulled pork), The Chapter (Italian) or any of the other many restaurants nearby. Visit Whitstable which is like no other town by the sea. Its traditional charms, strong arts culture and rich maritime history complement Whitstable’s modern appeal. Whitstable’s claim to fame is its oysters which remain an intrinsic part of this sea town’s character and are celebrated every July at the Oyster Festival (please note this is the 2016 website). One of Kent’s most beautiful gardens, Goodnestone Park Gardens, is only a 20 minute drive from Canterbury. Visitors to Goodnestone are always surprised to discover such a haven of beautiful tranquillity hidden away in south-east Kent. Shepherd Neame is the oldest brewery in Kent and a visit to Canterbury or Kent is not complete without a visit to one of their pubs, or a tour of the brewery. The Evenhill in Littlebourne or The Millers Arms in Canterbury are just a few of their many Kent pubs, all serving superb food and beer brewed locally in Faversham. Many of the Shepherd Neame pubs offer excellent accommodation too. With miles of dedicated walking and cycling paths, there is also plenty to explore on foot or bike. The Crab & Winkle Way between Canterbury and Whitstable for example offers a slice of east Kent, packed with history and nostalgia. The Great Stour Way follows the river Stour and the Oyster Bay Trail explores the Whitstable coastal area. For information on the above and much more – including details of Canterbury’s many events and festivals – visit www.canterbury.co.uk.